My sons like me to keep my recipes short and sweet, so they don’t get held up in their ‘Tesco Express’ reading my ramblings before they get to the ingredients list! There are pumpkins everywhere in October so they should be able to find all the ingredients they need, and if they are feeling lazy they might find some ready prepared and diced. So, if you do boys, don’t forget to add pumpkin seeds to the basket. Makes 3 big bowls. Heat a little olive oil in a pan and add the finely chopped pumpkin, onion, garlic and celery. Stir for a few minutes over a gentle heat and then add the Thai curry paste, the finely sliced red chilli, ginger, vegetable stock and fish sauce. Cover the pan and gently simmer for about 10 minutes. 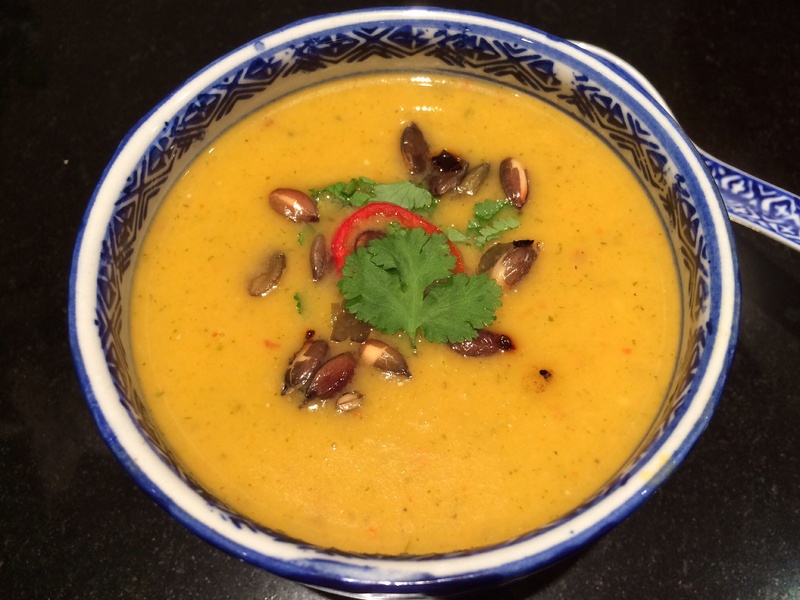 When the pumpkin feels like it is softening, add the coconut milk, chopped coriander (keep a couple of leaves for decoration). Continue to simmer for approximately 5 more minutes. 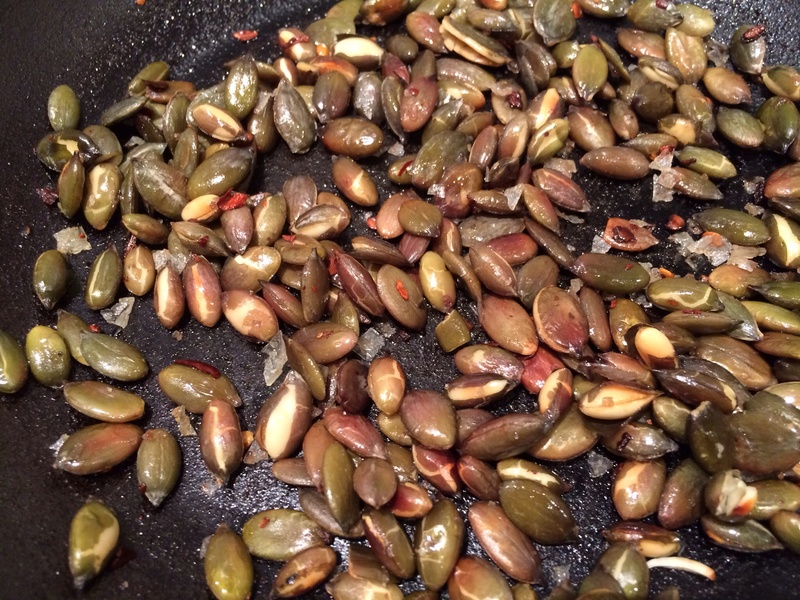 While the soup is cooking heat a little olive oil in a pan and add 50g of pumpkin seeds. Sprinkle over the dried chilli flakes and salt and pepper and move them around the pan for several minutes, coating them with the spice. They often make a popping sound when they are done. I love these. 50g is probably more than you’ll need but you’ll have no problem eating them. They are also great sprinkled onto salads. Blend the soup and check the seasoning. 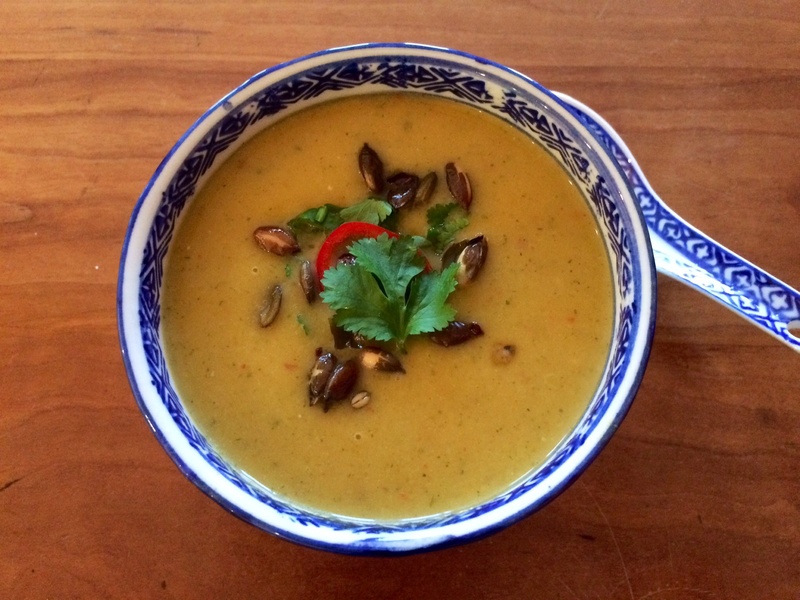 Serve with a few snipped coriander leaves and pumpkin seeds to decorate. ← 7 juices for 7 breakfasts.